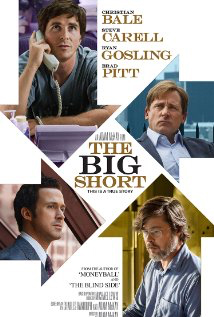 By genre, THE BIG SHORT merges Action with Farce but replaces physical derring-do with financial derring-do. If it were straight-forward Action/Adventure, a group of survivors would be scaling mountains, crossing raging rivers, and fighting off mutants while trying to escape a volcano that’s about to explode. But this story takes place in the world of high-stakes investment, so they do all of that metaphorically. The volcano that explodes, or rather implodes, is the real life, world-wide 2008 financial disaster. THE BIG SHORT executes the most ingenious solution to the problem of jargon-thick, technical exposition I have ever seen. The writers bring in “professional explainers” and puts them in various comic settings, such as a bathtub full of bubbles. The “explainers” then talk direct-to-camera in the simplest possible language, laying out the facts, hoping we get it. If we don’t, it doesn’t matter because at least they tried and we got some laughs. Like SPOTLIGHT, the audience knows the outcome of the story, and so watches it unfold from the point of view of the dramatic irony. But unlike SPOTLIGHT, THE BIG SHORT created morally complex, empathetic characters that face great personal risks. As a result, we feel for these guys. (See SPOTLIGHT review from last week).